Movie and TV studios don't often seek out the expertise of Stephen Kent Goodman, the proprietor of a company that provides music transcription services for enthusiasts of player pianos. So when the production team behind HBO's Westworld solicited Goodman's help in producing the bespoke custom rolls seen on the hit show, he was understandably psyched, if not a little daunted. "They were under deadline," said Goodman in a recent phone interview with Thrillist from the Gnaw-Vol-ty Rolls workshop in California. "They presented what we perceived as a nearly impossible project that had to be completed within a very short timeframe. Roll-arranging and -perforating doesn't work like that. It's a lengthy process." The request to produce authentic rolls fit with Westworld creators Jonathan Nolan and Lisa Joy's (expensive!) commitment to depicting the park as a meticulously crafted vacation experience for the very rich. So, despite his misgivings about the time constraints, Goodman was eager to work on a project that would shed light on the musical instruments, popular in the late-19th and early-20th centuries, that he refers to as "America's best-kept antique secret." If you've caught the ambitious sci-fi series since its premiere on October 2nd, you've seen and heard the end product of Goodman's meticulous work: the player pianos featured in the opening credits (above) and scenes set at the Mariposa Saloon, soundtracked by distinctive old-timey renditions of Soundgarden's "Black Hole Sun" and Radiohead's "No Surprises." As we later discover, Anthony Hopkins' Dr. Robert Ford also keeps one in his office. Goodman, who dropped out of the music program at USC to apprentice with a repairer of self-playing instruments, found the player piano every bit as appealing. "It was the answer to my prayers because there were no humans involved in the instruments," said Goodman. "There's no arguing. You just do the roll and stick the thing on and there you go." Despite how easy Goodman makes it sound, the actual process of creating a piano roll is a painstaking one -- though modern computer technology has sped it since the 1920s when composers like Igor Stravinsky used the player piano to create original compositions. After accepting the Westworld job, Goodman was sent a MIDI file of the composition he needed to work on. He then used his own notation program to translate the basic sound file into a "cutting file," which the perforator artist uses to punch slits in the paper and create the roll. When spun through the player piano, the roll creates the music you hear in Westworld's brothel. The skill set required to create an original roll is incredibly rare. The perforator artist who worked with Goodman lives across the country from him in Georgia. Because of the production company's time crunch, the finished roll had to be overnighted by FedEx back to California to meet Westworld's tight production deadline. "We made the last flight to LA," says Goodman. 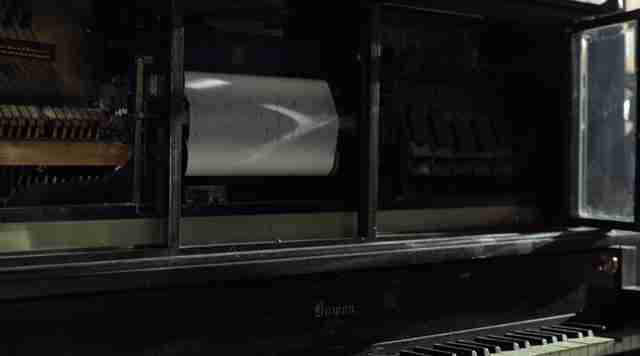 As creative as the use of the machine is on Westworld, Nolan and Joy are hardly the first science-fiction writers to use the player piano as potent metaphor for humanity's relationship to technology. In 1952, a then-30-year-old Kurt Vonnegut published his debut novel with the title Player Piano, which depicted a highly mechanized, post-WWIII society where middle-class jobs have been eliminated by highly efficient machines. Vonnegut used the the dated fixture of early 1900s saloon life as symbol for a world running without human involvement, placing it at the center of a scene early in the book that takes place at a rundown bar favored by lower-class patrons. The player piano clangs away as they drink away their sorrows. "Makes you feel kind of creepy, don't it," remarks one of the characters after seeing the self-playing instrument in action. "Watching them keys go up and down? You can almost see a ghost sitting there playing his heart out." Ever the optimist, Stephen Kent Goodman sees the contraption as something less ominous but just as fantastical. "They're time machines," he says. "The machine doesn't know it's not 1912. And there it is blasting out something that's a current hit of the day all on vacuum and pressure technology." Unfortunately, it's a time machine that's harder and harder to find -- at least outside of premium cable dramas starring Anthony Hopkins and Evan Rachel Wood. According to Goodman, many of the most beautiful self-playing musical instruments are owned by private collectors and not routinely put on public display. He says that he likes to prioritize his repair business on machines that will be displayed at museums, locals businesses, fairs, or other public areas. It's easy to see why he would be fearful about the player piano's future: nowadays the iPod is dismissed as a piece of outdated technology. For Vonnegut and for Westworld, the player piano is a symbol of a fallen world. For Goodman, it's just waiting to be discovered. "There's a whole generation that's waiting for it," he says. "That's what motivated me to stop what I was doing and take on this Westworld assignment. I thought, 'They're going to reach a lot of younger people with this and it needs to be done correctly.' So, they came to the right place." Dan Jackson is a staff writer at Thrillist Entertainment. As far as he knows, he is not a robot -- but he is on Twitter @danielvjackson.